The project involves collaborative research between the Muséum National d’Histoire Naturelle and Sami reindeer herders who for a decade have lived with severe winters due to climate change. The deer feed primarily on lichens in the winter, which they obtain by digging through the snow. The changes in the weather create a crust of hard ice over the lichen, preventing the reindeer from eating. 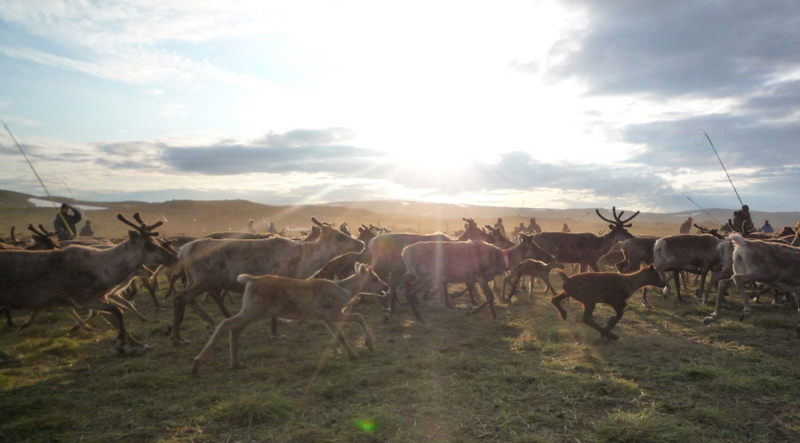 Sami have tried to adapt to this in a few ways, most commonly to gather the thousands of reindeer into an enclosure and feed them with livestock feed. This solution, however, has its own complications including the cost in time and money as well as the risk that the reindeer will not want to eat artificial food. The research will contribute to an understanding of the different coping strategies available, the contributive, cumulative impacts of climate change and other factors on the nomadic livelihoods of Sami reindeer herders, the impact of climate change on the forests and animal species of the North and potential solutions that different stakeholders, especially farmers, are advocating.